Strength (VIII) represents courage, confidence, and passion. The eight Major Arcana assures the triumph of intelligence over brute strength, and morality over evil. In older Tarot decks, Strength is referred to as Fortitude or Lust. These depictions were typically different from that of Strength today. In the ‎Visconti-Sforza tarot deck — the oldest surviving deck — Fortitude is depicted as a man beating a small lion with a club. For its part, Lust was typically depicted as an unclothed woman riding a lion. The English Rider-Waite version brought about the standard depiction of Strength that is now widely used. 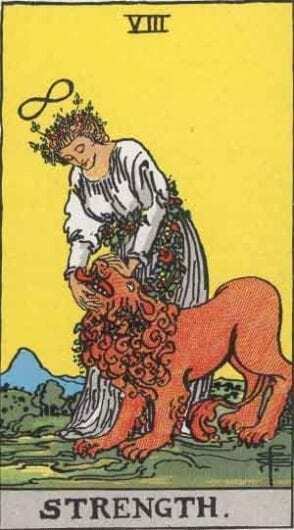 In this deck, a woman calmly pets a lion, showing her control over outside forces. The woman does not restrain the lion with a leash or beat it with a club. Instead, she controls it through compassion. Be it through compassion, cunning, or understanding, Strength signifies true control of a situation, and not simply the power to forcefully impose your will. The lemniscate — or infinity symbol — above her head signifies control of the self. By calming her inner storms of doubt, the woman becomes a true master of her mind. This gives her the strength and clarity needed to tame the lion, granting her control over all aspects of her world. Pulling the Strength card should be seen as a great compliment. In essence, Strength indicates that you possess a wealth of great qualities — courage, heroism, compassion, confidence, and composure. Others may look to you for guidance or you may feel that you can easily manipulate your peers. This is more of a responsibility than a boon. Do not abuse your power or you will see it slip away. Remember that Strength favors defending the just and righteous. In its upright position, Strength is a positive pull. You already possess the characteristics that you need to succeed in your pursuits and are ready to take the next step in life. While there may be challenges ahead, you will easily overcome all the obstacles on your path. For the singles among us, this reading indicates that it is a perfect time to meet someone new. Your confidence will be rewarded with an adventurous relationship, likely with someone exciting and unconventional. Those in a stable relationship should view Strength as a good indicator that this relationship is solid. Any problems that arise only serve to strengthen your bond as you overcome them together. You should get used to waking up to your partner’s embrace, yours is a love that can go the distance. Now is the time to make a move to further your career. Use your confident demeanor to ask for the promotion or the raise that you deserve. If you have been considering a business venture, Strength should encourage you to take that leap. Jumping in with both feet may seem risky, but being overly cautious will be your downfall. If you are looking for a job, Strength emphasises following your passions to find success. Consider a career that focuses on providing assistance to others, particularly vulnerable people. You might also fare well in a field that involves caring for animals. Your cash flow should be good for the time being. Strength doesn’t mean that a windfall is coming your way, but a stable financial increase — a raise, for instance — is forthcoming. Save more of this money than you normally would, even if you feel the need to treat yourself or lend your friends cash. You will need these savings to make a large purchase sooner than you think. Avoid borrowing large sums of money in the immediate future. Both in body and mind, Strength is a fantastic indicator that your health will only improve in the coming period. Use this advantage to quit bad habits or take on new healthy ones. Taking steps to improve your diet or starting a new workout plan will be easier than anticipated. Reverse Strength isn’t a perfect mirror image of upright Strength. It brings many of the same good fortunes as upright Strength, only with additional obstacles. If you can find the power to overcome your weaknesses, you will achieve the same success as those that draw Strength in the upright position. For those looking for love, this should serve as a warning. You might not be ready to enter into a successful relationship. Deep down, your self-doubt may be throwing you off your game and leading you towards bad partners. Focus on building your self-confidence, and reassure yourself that you are worthy of a great partner’s love. If you do this, you will find romantic success in the long term. If you are in a relationship, you might be jeopardizing it through your jealousy and lack of confidence. Clinging too hard to your partner will backfire. Give them the space they need and have faith that your relationship will succeed. Like upright Strength, reverse Strength indicates that you have the ability to further your career and succeed. However, you have been letting your self-doubt and fear hold you back. Your worst enemy has been yourself and only you can move past this speed bump on your journey. Find the strength to be bold and unabashedly present your ideas. Thankfully, reverse strength is quite similar to the financial forecast of upright Strength. You should see money coming in for the time being, and this money should be saved. Unfortunately, instead of a large purchase this money will likely be needed to pay off an unexpected fee — perhaps a ticket or unusually large bill. If you have saved properly, this should not be a great issue. Though your overall health will be good in the immediate future, a bad habit of yours will catch up to you sooner than you expected. Now is a good time to quit or cut down on this vice to avoid these repercussions. Don’t tackle every issue at once, focus on making sustainable life changes. The past position for Strength is a particularly interesting state. This often refers to your composure in the face of adversity leading to your current success. In some cases, Strength in the past position refers to your ability to consistently seek new challenges, never settling into a single position for too long. Essentially, Strength in the past signifies constant transition and victory through your iron will to hold it all together. In the present position, the Strength card is a challenge to take on more. Do not turn down opportunities simply because they are risky or difficult. The odds are in your favor, and now is the time invest yourself in uncertain ventures that you are passionate about. In the future position, Strength is an encouragement, promising that your current troubles will soon be under control, and might even contribute to your success. Strength is always a welcomed card in a reading. It embodies courage above all, but courage come in many forms: it can mean taking a swift risky action, or persevering through long periods of hardship. When combined with most cards, the pairing advises how to best use the Strength card’s power. The Tower alone signifies chaos, bankruptcy, and abandonment. It is a foreboding draw in nearly any reading, however when combined with Strength the pairing is actually quite positive. The coupling of Strength with the Tower denotes the mastery of chaos, overcoming the odds, and risk producing success. If you find yourself with this pairing, high stakes should produce high rewards. On its own, the Magician refers to focus, willpower, and self-confidence. Both the Magician and Strength share the lemniscate (∞), which signifies the element of self mastery that both cards embody. When they appear together, this factor is magnified to denote your power to control the flow of events in your favor. The Eight of Cups urges you to challenge the status quo. It also represents loneliness, abandonment, and disappointment. When combined with Strength, leaving your comfort is more immediately rewarding. Your self-confidence and willingness to strike out on your own will lead to success. The Eight of Pentacles alone is about commitment, apprenticeship, and employment. While many combinations with Strength favor bold action, a pairing with the Eight of Pentacles rewards a different path: that of patience. This pairing emphasizes the Eight of Pentacles’ message to remain consistent in your actions. It promises a great reward for the efforts put into your task. Strength is most likely a yes, particularly when it comes to tackling issues that you are passionate about, in seeking justice, and in love.